NDC offers a variety of free e-learning opportunities to support the postsecondary success of deaf students. Earn RID CEUs by completing one of our short courses or dig deeper and enroll in one of our course series. 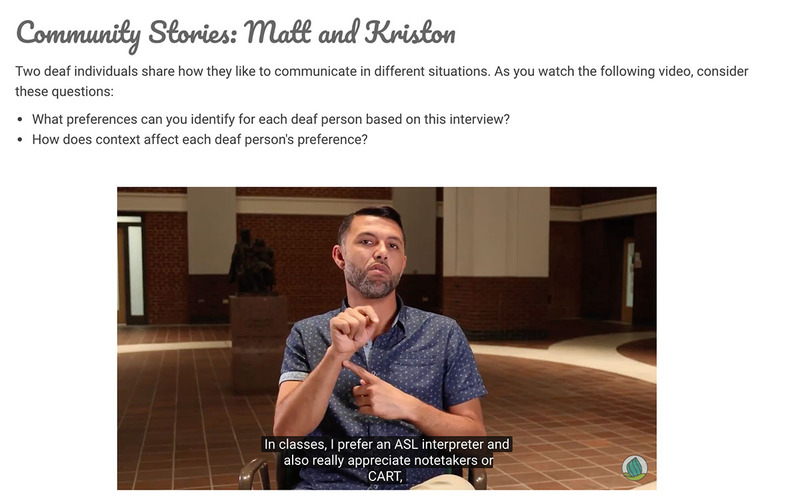 Individuals who take classes with NDC | explore will be able to view real stories shared by deaf people across the country, discuss concerns and challenges with others, and learn from national experts. For information on all of our current courses is available on our Canvas Catalog. Subscribe to our newsletter to stay informed about new e-learning opportunities. Having an understanding of the communication preferences of students is the cornerstone of providing effective services for deaf individuals. Effective communication affords deaf individuals the ability to give or receive information in a manner that is best for them and which will create opportunities for full participation in the programs offered by the institution. Course 1 in our Effective Communication course series gives an overview of the key concepts in effective communication in various settings after high school, including defining legal responsibilities of institutions, coordinating communication access services using an interactive process, providing access via qualified service providers, and using best practices when making accommodations decisions. Click here to take the course! The Test Equity course series provides professionals with essential information to improve test equity for deaf individuals. 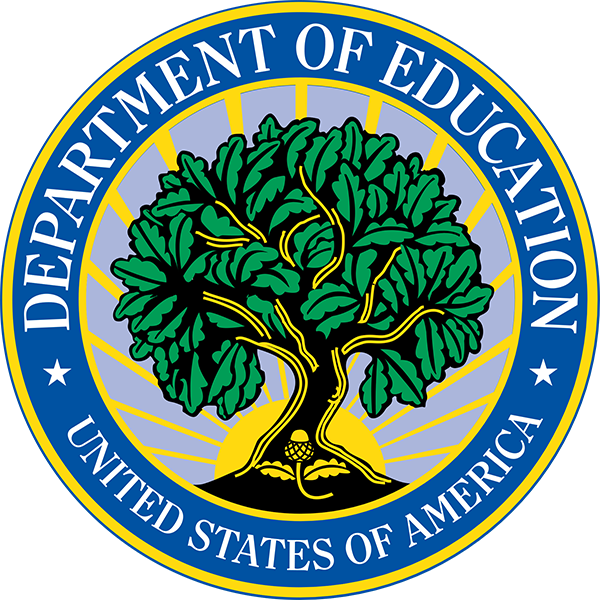 Course 1 provides an overview of key issues, including definitions of test assessment, key terminology in test assessment, the basics of equitable tests, and how accommodations can improve test equity for deaf students. This course will eventually be supplemented by Courses 2 and 3.
identify key issues in interpreting test results for deaf individuals. This course provides concrete strategies to test developers and deliverers to improve test equity and measurement for deaf students. How can applying Universal Design principles improve equity? How is bias related to test equity and what can test developers do to make advances in fair testing? What role can accommodations play in improving test equity and what are the limitations of accommodations? 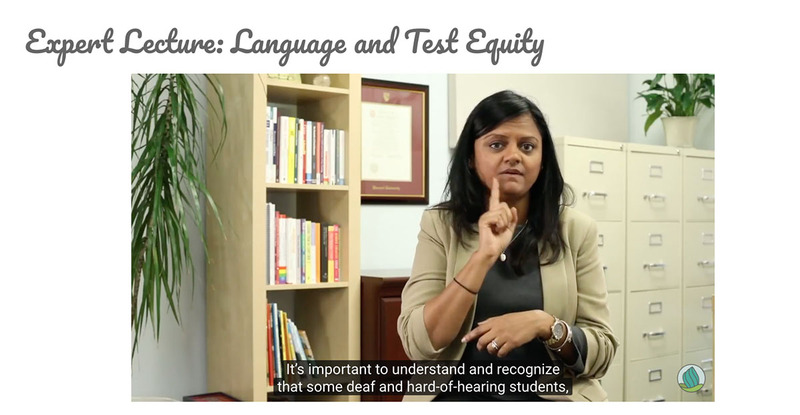 This course digs deeper into what test equity means for deaf students. Note Taker Training is a self-guided online training course that defines the role of the note taker and provides note taking strategies that enable student note takers to provide accurate, comprehensive classroom notes for deaf students. The training can be completed in multiple sessions or all at once. When students have gone through all of the material, they can take an online quiz to evaluate their knowledge. Students with a passing score will earn a Verification of Training Completion certificate that they can print. This course was adapted from a pepnet2 course. What are my username and password for Canvas? I registered for the course, but I did not receive an email confirmation. What do I do? Once you register for a course, it will automatically show up in your catalog dashboard. Click here and log in to access the course. Can I leave a course and come back? Can I take more than one course at a time? Yes, you can leave a course and come back—your progress will be tracked in the modules tab. You can enroll in multiple courses—they will all appear in your user dashboard. Do you offer CEUs and CRCCs for courses? How many? We offer CEUs through RID’s Certificate Management Program. You may be able to transfer these CEUs to other programs. Ask the organization if they accept RID CMP CEUs. The amount of CEU credit for each course can be found here. CRCCs for our courses will be offered soon. Subscribe to our newsletter to receive updates, or follow us on social media to stay in the loop. At the end of the course, follow the instructions in the Certificate Module to select and generate the appropriate certificate for your needs. If you cannot see the selection screen, please try it in a different web browser. Our courses are only supported in the most recent version of Safari, Chrome, and Internet Explorer. We cannot generate a certificate for you, but we can help you if you selected the wrong certificate. Email us to change your certificate selection. I completed the course, but I don’t see my CEUs on my RID transcript. We submit CEUs to RID on a monthly basis. We only submit RID CMP CEUs. Participants submitting CEUs to other programs are responsible for managing their own documents. If you do not see your CEUs reflected on your transcript after 45 days, please email us. Are there enrollment limits for the courses? Our self-paced courses (Note Taker, Effective Communication Access 1, and Test Equity 1) have no enrollment limits. Only facilitated courses have enrollment limits, but we are not offering them yet. Stay tuned! How do I update my user information on Canvas? Find instructions to edit your user settings here.